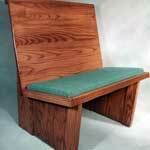 The Marshall Company manufactures several styles of custom specialty pews, each designed with a specific need in mind. 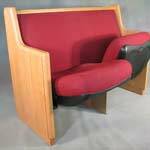 The Marshall Cathedral pew incorporates a continuous pew back, with an individual self-rising theatre seat. This gives the appearance of a traditional pew, with the benefit of an individual seat. This pew is perfect for limited space areas such as choirs and balconies. Available with or without armrests. 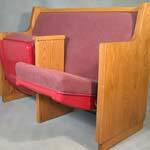 The Marshall Company also offers a line of pews with a smaller, removable seat cushion instead of a fixed continuous seat. The seat cushions can be made in any length, from 24 inches to 6 feet. The cushions can be easy removed for cleaning or re-upholstering, and with the smaller lengths, wrinkling of fabric is less of an issue. 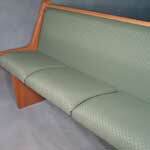 We can also work with you to modify our existing pew bodies to fit your own needs. We often modify our standard cap rails, seats or backs to fit an architects or designers own vision. 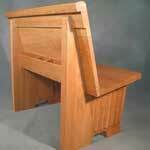 This custom solid American Cherry pew body has a modified cap rail, and 2 inch thick scalloped supports. 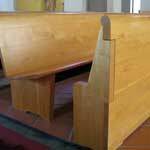 A custom cap rail, supports, and modesty screen adorn these solid White Maple pews.